“Tori no Karaage” is Japanese Fried Chicken. However Karaage means a cooking style and we also use fishes (I’ve posted Karaage of Flying Fish), chicken is most popular and sometimes called as just “Karaage”. 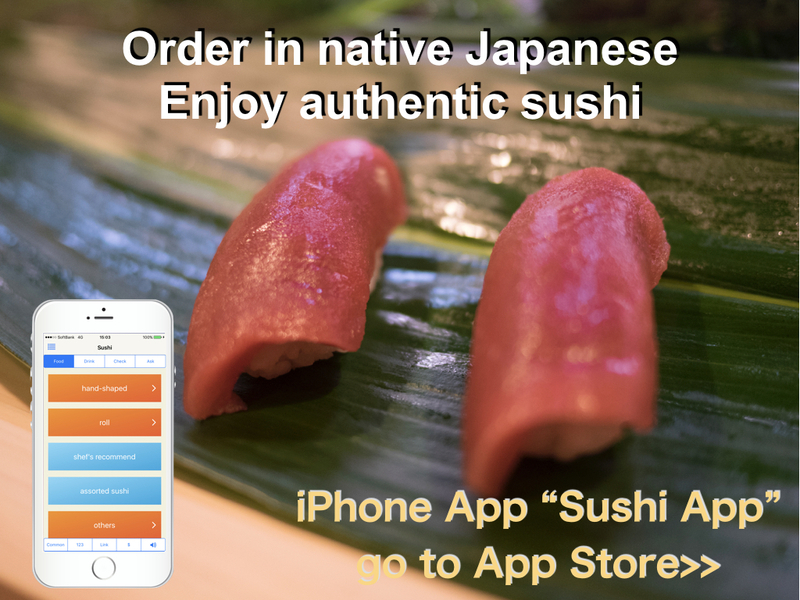 It is cooked at home well and many casual Japanese restaurants such as Izakaya or Teishokuya serve. Also it is often in a Bento lunch box either home made Bento or Ekiben. In Japan, if we say “Fried Chicken”, many people imagine it is Kentucky Fried Chicken (KFC). It’s loved by many people here, too. There is one interesting story regarding KFC recently. KFC Japan has started new shops which dedicated on “Karaage”. Those shops are selling only Karaage, no regular fried chicken. There are many chicken foods here, this may be a most loved chicken food by many people, men or women, child or aged. 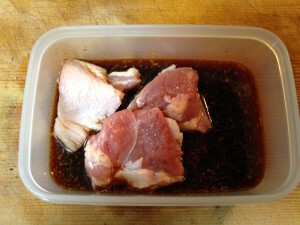 2) Cut the Chicken as a bite size and sprinkle some salt and pepper. Then dip in soy source and grate ginger for about 15min. 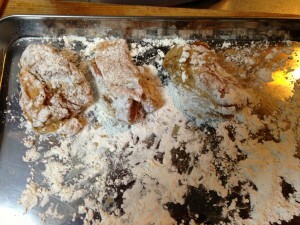 3) Drain off the source and coating chicken with flour. 4) Add cooking oil in a pan about 2cm depth and heat about 160 degree (c). 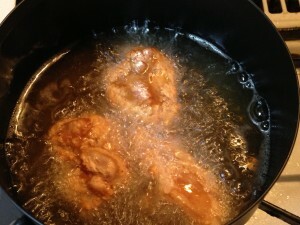 5) Fry chicken in the pan. Do not touch chicken for about 2 or 3 min., then flip it over. 6) When chicken becomes golden brown, pick it up. Above photo looks too much fried. It may be better I fried it little shorter. It usually serves with lemon. It is already added enough taste, so you can eat it without any source. 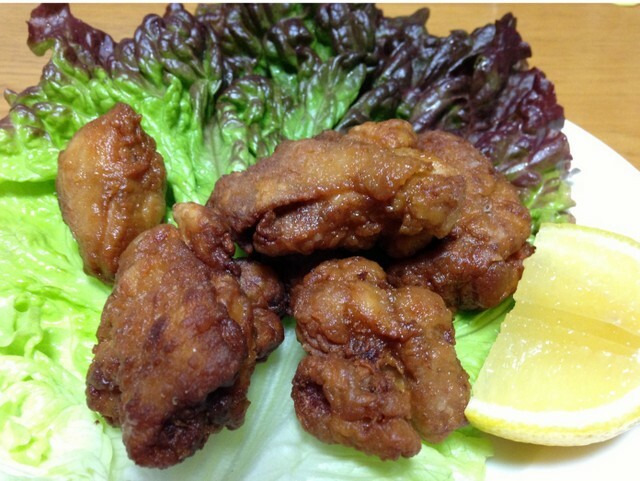 There are many recipes of Karaage. 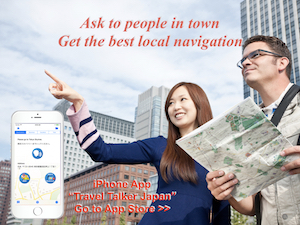 Depending on region or home, they are different. Some are using grater garlic instead of ginger, or both for dipping source. I used only flour for coating, but some people use potato starch in addition to flour. Using only potato starch is different menu. It is called as Tatsutaage and looks more white. I will try Tatsutaage in the future.